We had planned that I would come home from work during the noon hour, take John to a medical appointment that requires someone to drive you home. I would return to work for a few hours until John summoned me to take him home. But at the last flock check just before I arrived, John was shocked: Roberta was in the stall, on her back, legs flailing. He called me to tell me she was in labor. He would have to drive himself to the clinic, I would tend to Roberta, then arrive at the clinic by 4:00 to pick him up. We could deal with his car later. When I first glimpsed Roberta, it looked as if she were having convulsions. She was FLAT on her back, hind legs extended like sticks. You NEVER see sheep on their backs. Their inflexible spine just doesn’t allow it. But there she was. I ran for the house, clothes and shoes flying as I switched to farm gear. Grabbed a bucket and towels and a gallon jug of propylene glycol which is used to treat pregnancy toxemia. In the stall, I could see little hooves and part of a nose. I tugged on the hooves and two legs easily pulled out. I followed the nose up and around to grasp the head and began to pull. Roberta had a big contraction. Before John was out the driveway, I was laying a lamb next to Roberta’s head. She licked it frantically. Having dealt with that, I could pause and evaluate Roberta’s situation. It seemed the stall is not completely level, and somehow she had laid on her side with her legs pointing slightly uphill. I tried to roll her up in the direction her feet pointed [her right side], but it seemed impossible–very heavy pull downhill. I wondered, would it help if I just rolled her over onto her left side? I tried it and over she went. In seconds she was on her feet, happily licking that huge, strong lamb who was already on his feet. Suddenly she looked just fine, no longer on the verge of death. But she was laboring again. Once again there were feet and a nose, and again I pulled when she pushed. Another fine lamb, but it was limp. The cord must have been pinched during those long minutes on her back. I cleared the airway, patted the chest in a version of lamb CPR, swung the lamb by its hind legs, but all to no avail. Roberta tried too, licking her for a long time. She could not be revived. We are so happy that Roberta is OK and that she has a fine strong lamb. So that is how our afternoon began. In the photo you can see Roberta licking her second lamb. Sigh of relief. I went inside and made some toast for lunch. 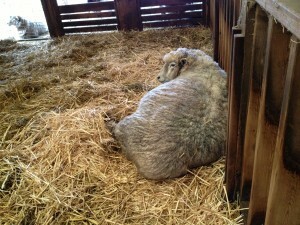 Then I returned to the barn, dealt with the stillborn lamb, dipped the navel, weighed the big boy –14 lbs! — and took Roberta into the lambing pen. That is when I noticed Melissa standing around, looking preoccupied, not chewing her cud. I watched her back hunch with a big contraction. Soon I would need to depart for Beaverton to pick John up. Next time I looked Melissa had gone into the main stall. I closed the gate to keep her there and keep the other sheep out and departed. Two hours later, we are back. John has had a small snack and seems fully recovered from the fasting and the anesthetic they gave him. Melissa has a huge water balloon protruding. We strategize: divide the big stall into two smaller ones, and use one for the “nursery” which suddenly has six lambs and three ewes, soon to be nine lambs and five ewes. We will add chicken wire to the gate so lambs don’t accidentally end up out in the pasture without their mothers, then we will build the dividing wall, and meanwhile we will monitor Melissa and put her in the lambing pen when the time is right. Up to the garden shed to find the chicken wire. To the barn to cut it into lengths. Zip ties to attach it to the gate. 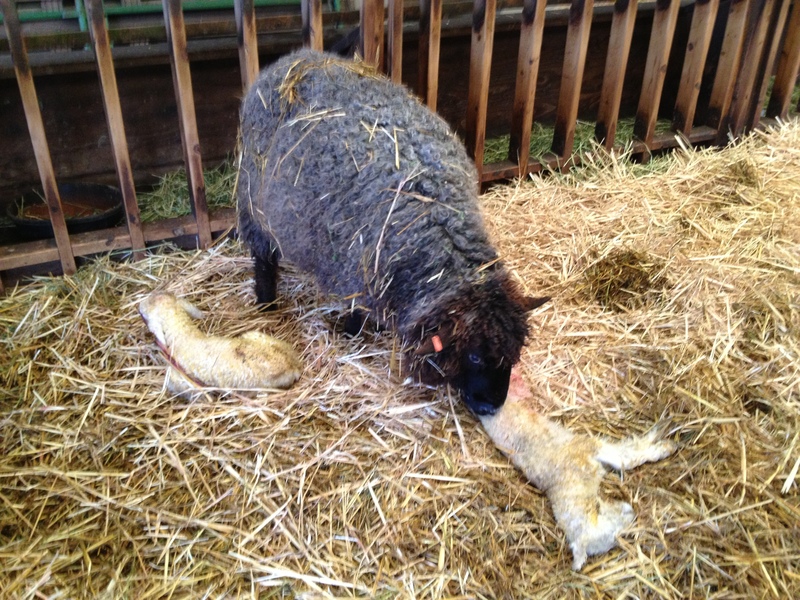 A quick peek into the main stall: oh look, Melissa has given birth to a lamb! They look fine, we will deal with them when the fence work is done. John cleans out the pen and we add fresh straw. Melissa happily follows her lamb into the pen. We begin moving fence panels into the main stall so we can construct the dividing wall. Meanwhile Melissa lies down and makes a sound. 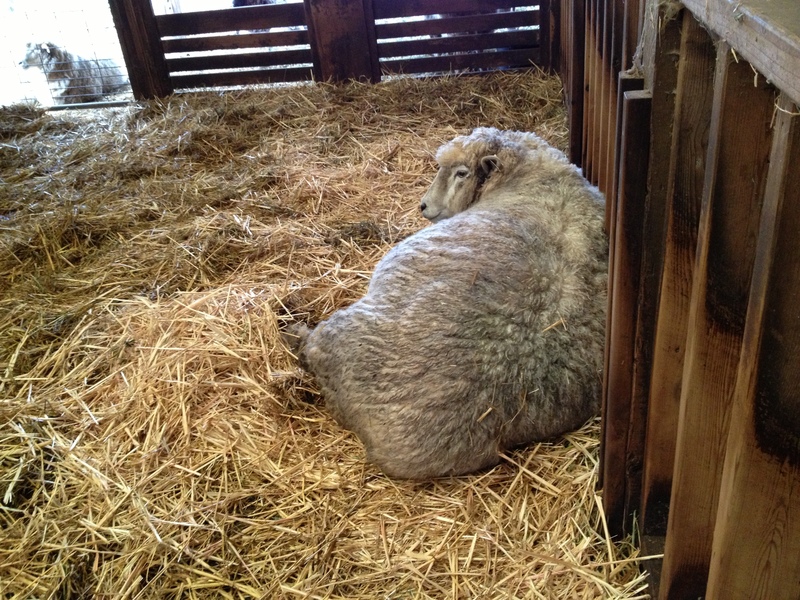 Next time I look there is a big lamb, still wrapped in its amniotic sac, lying behind her. Clear his mouth, drag him up to his mom’s nose, and get out of there so she can bond with him and keep licking both her lambs. The photo shows Melissa laboring. Back to the stall remodeling, then dinner and a little break. I sit in my chair with the heating pad–my back is still not fully recovered from a fall in the stall a month ago. Around 10:00 we check the barn. Another ewe, ear tag 1105, is pawing the ground in the corral. We watch her contort with strong contractions, but there is no outward evidence of lambs as of 11:15. We enclose her in the main stall and go to bed. zzzzzz At 4:00 a.m. I go over to check on her. Twins! Looks like the second one has just been born and mom is very busy licking. Back to bed, they are safe inside the stall for now. 6:00 a.m. and it’s time to get up. 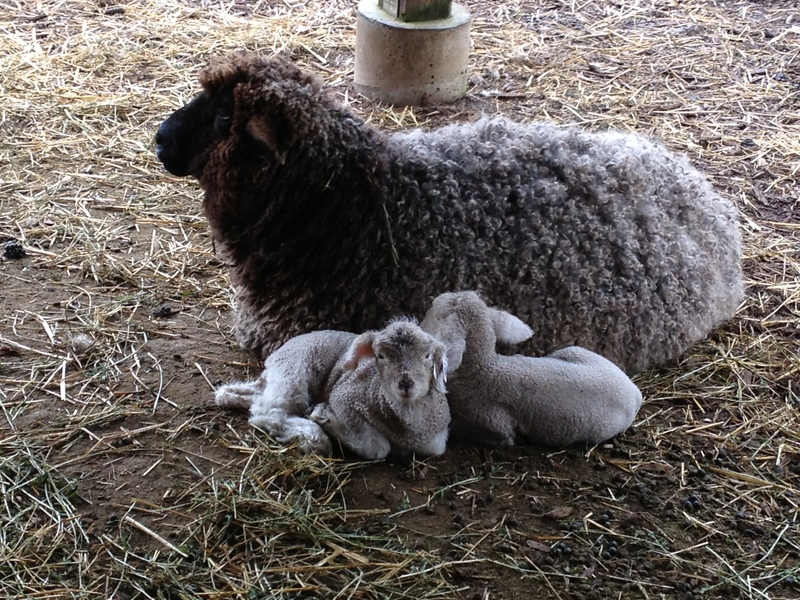 The lambing pens are occupied and we have another set of twins. John says, “let’s plan this.” Before we shower we are in the barn, dipping navels and weighing, gently releasing Roberta and her day-old lamb so that Betsy and her twins can move into the special pen. Finally we can open the main stall for the rest of the flock and feed them their breakfast! So that is six deliveries in 16 hours. Nothing at all compared to the huge sheep operations you see in the valley or in Australia and New Zealand. But something special for Wetland Wool. 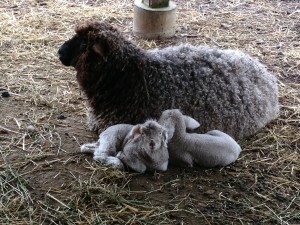 When I started this blog post, “half done” meant that half the ewes have lambed. But because of Miss 1105 [Is it Betsy? I can’t remember] we are at 60%, 6 of 10 ewes have had their lambs.